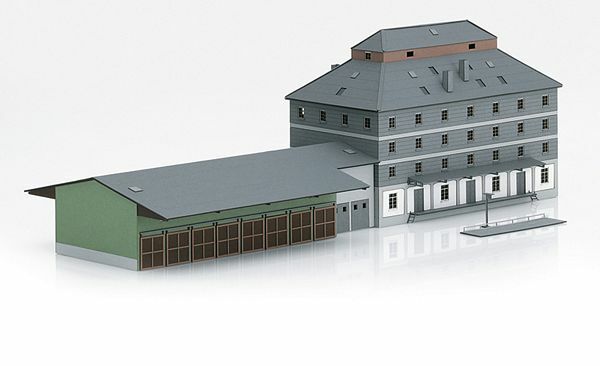 Model: Kit for the "Raiffeisen Warehouse with Market". The prototype stands in Eckartshausen near Crailsheim, right in front of the station, and it still had a track siding up to the mid-Nineties. It now belongs to the BAG Hohenlohe (formerly Velag, United Farming Coop). This kit consists of laser-cut, colored architectural hard cardstock. It has the finest laser-engraved details. Extensive instructions for building the kit are included. Dimensions (area): 174 x 98 mm / 6-7/8" x 3-7/8".